In my little town of Westlake Village we don't have an actual "town center"; but the closest thing is an upscale shopping center called the Promenade. And we don't have too many traditions (it's not a very old town). 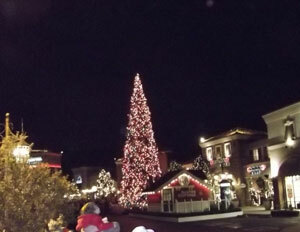 But we do have a rather nice one, that on the Friday before Thanksgiving there's a tree lighting ceremony at the Promenade. There's a little musical number with volunteers, and fake snow, and then Santa arrives, and the enormous Christmas Tree next to "Santa's Cabin" is lit, and everybody sings, and fireworks fill the sky. Okay it's corny, but it's harmless fun. Somehow this night always contrives to be *cold*, at least by Southern California standards, and we all stand around blowing steam and drinking hot chocolate. And so it was that today I left late afternoon for the gym (it was too cold for a ride, 50, brrr), and I saw all this traffic at the Promenade, and I whacked myself on the forehead and said "of course tonight is the tree lighting"! And I turned around and headed home, and picked up Meg and Alex met us there, and we watched the tree being lit and all, and it was great fun.